This is the best car for you if you want a midsize sedan that looks as good as it drives. It’s far from the quickest entry in its competitive set – Mazda’s working on that for model-year 2018 — but the twenty-seventeen-and-a-half (2017.5) Mazda 6 is the most athletic and one of the most stylish. As for that half-year tag, Mazda is extending production of the model-year 2017 version of this car while it prepares for the Spring 2018 launch of the revamped ’18 edition. The strategy involves adding some standard and optional equipment to two of the three 2017.5 trim levels as a stopgap response to the redesigned 2018 Honda Accord and Toyota Camry, rivals already on sale. A glut of Mazda 6s on dealer lots means salespeople should be very opten to deep discounts on the 2017.5 on price. The current-generation Mazda 6, which comes from Japan, debuted for the 2014 model year and was the second vehicle to adopt the brand’s SKYACTIV design philosophy. The goal of this holistic system of automotive design is meant to improve fuel economy by reducing weight and friction, rather than through the development of expensive alternative propulsion methods, such as gas/electric and plug-in electric hybrids. Indeed, the 6 is one of the lightest vehicles in the class, and you would have to turn to a hybrid or diesel to find a model with better fuel economy. So it sips gas, moves with the grace of a figure skater, and it looks like a supermodel – that combination should see this car flying off dealer lots, right? Well, not so much. While nearly every midsize sedan saw sales drop in calendar 2017, the 6 was among the hardest hit, posting a 26 percent decrease versus 2016. Less than 35,000 buyers chose a 6 in calendar 2017. Meanwhile Toyota sold more than 43,000 Camrys in December 2017 alone. Should you buy a 2017.5 model or wait for the ’18? Tough call. Mazda’s adding some standard and optional equipment to the base Sport and mid-level Touring models for 2017.5; the flagship Grand Touring is unchanged. Those upgrades are detailed below, but they may not be enough to prevent you from waiting for the 2018 Mazda 6. It’ll boast updated exterior and interior styling, a new flagship Signature model, and most important, an available turbocharged engine that will help it better compete with top-end versions of the Accord, Camry, Chevrolet Malibu, Ford Fusion, Hyundai Sonata, Kia Optima, and Nissan Altima. There are also rumors of available all-wheel drive versus the front-drive only setup of the outgoing car. Styling: No changes here. Mazda updated the current 6’s styling for the 2016 model year, and it will be changed again for 2018. The 2017.5 version remains one of the best-looking cars on the road, with flowing lines that make it look more expensive than it is. Visual differences among the three trim levels are down to wheels and available lighting. The Sport has 17-inch alloy wheels, while the Touring and Grand Touring use 19s, with the latter having a unique paint finish. Steering-linked LED headlights are standard on the Grand Touring and optional on the Touring. Exclusive to the Grand Touring is a subtle LED light strip around the grille. The 6’s cabin is similarly upscale, with fine materials and excellent overall build quality. The front seats have prominent side bolsters to keep you in place during spirited cornering, but those who are larger of frame may find them confining. The front armrest is positioned a bit too far back on the center console, so shorter occupants may have to balance their arms on the small padded space next to the cupholders. Legroom is fine all around, but rear-seat headroom is tight due to the slope of the roofline. In the back, you also sit rather low to the ground, and the seat cushion could use some more thigh support. A tall hump in the center of the rear floor essentially precludes anyone from sitting there, which is odd because the 6 is a front-drive car; such raised areas are common on rear- and all-wheel-drive vehicles to accommodate a driveshaft. The dashboard design is sporty and contemporary. The gauges are clear, and Mazda offsets its “multi-information display” to the right-most instrument pod rather than situating it in the middle like in most cars. It keeps the speedometer dead ahead, which we appreciate. What we don’t like as much is the Grand Touring’s small plastic panel that projects vehicle speed, traffic sign, and safety system data in the driver’s line of sight. You can turn off the projection, but you can’t retract the panel – it pops up when the car starts and retreats when it turns off. For 2018, Mazda is supplanting the small panel with a true head-up display that puts information right on the windshield. We have mixed feelings about Mazda’s infotainment system. The central screen sits atop the dashboard, but instead of a touchscreen, it relies on a BMW i-Drive-style control knob in the center console. It allows quick access to audio, vehicle setting, and available navigation functions. Some operations, such as programming radio presents, require far too many steps to complete, though once you’ve done so, they are easy to call up. Rain-sensing windshield wipers are available, though their behavior can get erratic in light drizzle and snowy conditions. Thankfully, software engineers programmed the ability to disable this function through the infotainment system, which is something that was lacking in previous Mazda vehicles with this feature. Neither Apple CarPlay nor Google Android Auto is available on the 2017.5 model; we hope Mazda rectifies this as part of the car’s 2018 update. Mechanical: All 2017.5 Mazda 6 models employ a 2.5-liter four-cylinder engine with 184 horsepower and 185 pound-feet of torque. That competitive against other standard engines among midsize cars. Sport and Touring grades come standard with a slick 6-speed manual transmission. Optional on those and standard on the Grand Touring is a 6-speed automatic, which seems a bit out of step with rivals that have 8-, 9-, or continuously variable automatics, but with near top-of-the-pack fuel economy ratings and exceptional responsiveness, it doesn’t matter that much. Acceleration is adequate, aided by the 6’s curb weight, which is around 150-200 pounds lighter than most rivals. A throttle-quickening Sport switch is helpful for high-speed merging and passing. This car deserves a more powerful engine, and Mazda will deliver in 2018, with a version of the 2.5-liter turbo four-cylinder that powers its seven-seat CX-9 crossover. Expect horsepower and torque figures of 227 (on 87-octane gasoline) or 250 (on 91-octane premium) horsepower and 310 pound-feet of torque. That’s more torque than what Toyota offers with the 2018 Camry’s available V-6 engine. Handling is the 6’s strongest asset. This is one of the sharpest front-wheel-drive vehicles on the road, with precise steering, terrific grip, and virtually zero body lean in fast turns. It punches well above its weight class, rivaling even some far costlier rear-wheel-drive-based luxury cars. There is a bit of a tradeoff in terms of ride quality. It’s never uncomfortable, but it is noticeably firmer than its rivals, especially with the 19-inch tires on the Touring and Grand Touring. Speaking of the tires, despite being all-season, they are biased toward dry-road handling. They don’t grip as well in the wet and snow, so it may be advisable to have a set of winter treads handy if you live in such a climate. The engine sounds a bit loud on cold start, but it warms up quickly and produces a rich, refined sound during acceleration. Tire noise is an issue on the Touring and Grand Touring on account of their more aggressive tires, but wind rush is very well controlled. Features: Sport and Touring models were on the receiving end of some new standard equipment. The former has the usual array of standard amenities that are common to entry-level midsize sedans, though it does have an electronic parking brake and pushbutton engine start. Blind-spot alert with rear cross-traffic detection is newly standard on this model. Upgrading to the Touring adds 19-inch wheels, power driver’s seat, dual-zone automatic climate control, leatherette upholstery, rain-sensing windshield wipers, and automatic emergency braking. Its 2017.5 additions include heated front seats and imbedded GPS navigation. The Grand Touring has a power sunroof, power front-passenger seat, leather upholstery, driver-seat memory, heated exterior mirrors with auto dimming for the driver, Bose-brand audio system, adaptive cruise control, and lane-departure warning with automatic steering to help keep you in your lane. With manual transmission, the Sport starts at $22,835 and the Touring at $25,085. The automatic transmission is a $1,050 option on these models and is required for the Touring’s two extra-cost packages. First is the self-explanatory $1,325 Bose/Moonroof/Satellite Radio Package. Checking this box opens access to the $1,425 Touring Premium Package, which adds LED headlights and daytime running lights, imbedded garage-door transmitter, heated exterior mirrors with auto dimming for the driver’s side, leather upholstery, and a power driver’s seat. The Grand Touring starts at $31,585. Its $2,500 Premium Package includes a heated steering wheel, heated outboard rear seats, a black headliner, Nappa-brand leather upholstery, and Mazda’s i-ELOOP energy regeneration system. i-ELOOP captures kinetic energy while coasting and braking and stores it in a capacitor to use for powering the car’s auxiliary systems. This eases the burden on the engine and alternator, resulting in better fuel-economy ratings. 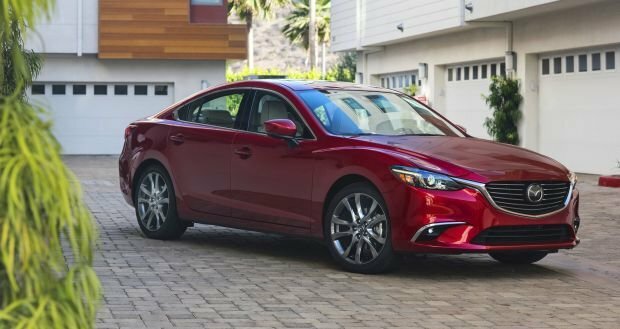 About 7 percent of Mazda 6 buyers choose manual transmission, and if you can live without some of the Touring’s niceties, a Sport so equipped is a lot of car for less than $23,000. The 93 percent who choose the automatic will get the most for their money in a Touring with no options, especially since automatic emergency braking is standard. At more than $31,000 to start, the Grand Touring offers some high-end accoutrements, but it’s competing with versions of other midsize sedans that offer similar features but with substantially more power. EPA-estimated fuel-economy ratings are near the top of the class. With manual transmission, the 2017.5 Mazda 6 rates 24/34/28 mpg city/highway/combined. Most automatic models rate 26/35/29 mpg while the Grand Touring with i-ELOOP gets a small boost to 27/35/30. We averaged 28.5 mpg in a test consisting of mostly suburban commuting, with some low-speed winter-weather slogging. All models use regular-grade 87-octane gasoline. A substantial freshening for model-year 2018, with updated interior and exterior styling, a new flagship Signature trim level, an available turbocharged engine, and the likelihood of available all-wheel drive. 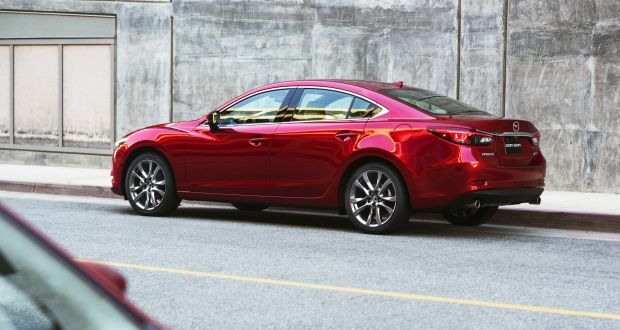 The 2017.5 and 2018 Mazda 6 will belong to the car’s third design generation. The first two, which debuted for model years 2003 and 2009, were born out of the Japanese automaker’s partnership with Ford. The car was assembled at the same Michigan factory as the legendary Mustang. Ford divested itself of Mazda during the global recession in 2008 and has been independent ever since. In recent years, the brand has formed a few strategic partnerships with some unlikely allies. Despite its Italian name and heritage, the Fiat 124 Spider is built by Mazda in Japan using some running gear from the MX-5 Miata. In Mexico, Mazda makes the Yaris iA (formerly the Scion iA) for Toyota. In January 2018, Mazda and Toyota announced a joint venture to build a new assembly plant in Huntsville, Alabama, that, starting in 2021, will produce an as-yet unannounced Mazda crossover as well as the Toyota Corolla.